I was born and raised in Winnipeg, and currently live just an hour north of the city. But it took me three years to finally visit the Canadian Museum for Human Rights (CMHR) that has been open to the public since, September, 2014. Why did it take me so long to visit the CMHR–Canada’s first national museum outside of the National Capital Region (of Ottawa and area)? Why did it take me so long to visit this architectural wonder in my own hometown? Why did it take me so long to visit something that I clearly support and believe in, as I have been a donor to the museum since they launched the public fundraising campaign quite a number of years ago? Our tour guide Nick gives us an intro of the Canadian Museum for Human Rights, with the Welcome sign in the background. The Welcome sign contains living images that walk onto the screen and write welcome in one of more than 30 languages. It’s because I thought that it would be a completely sad experience, and I admit to trying to limit the amount of negative energy that comes into my life. But I was wrong! The CMHR is the first (and to my knowledge only) museum in the world dedicated exclusively to the evolution, celebration, and future of human rights. That means there are as many happy stories that are told and celebrated as there are horrific ones to acknowledge. The mantra of the museum is celebrated throughout its exhibits: All human beings are born free and equal in dignity and rights. If only the politicians of the world would act by that philosophy, we would see an end to war and crimes against humanity. The Holocaust Gallery reminds us how volatile that dream can be, and even includes one of the gas canisters that would have been used to execute some of the six million Jews who were killed in Europe between January, 1933, and May, 1945. 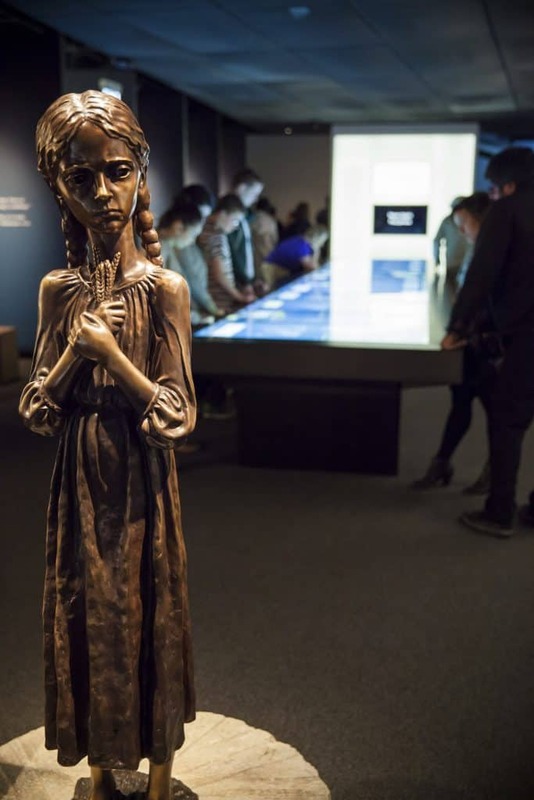 The adjacent “Breaking the Silence Gallery” is devoted to four other modern-day genocides that include the Holodomor in which 10-12 million Ukrainians are reported to have been starved to death by the Soviet leadership between 1932 and 1933. I found that figure to be alarming, as both my parents were of Ukrainian heritage and I had no idea of the magnitude of that genocide which undoubtedly took the lives of members of my own extended family. This piece of art is entitled “Bitter Memories of Childhood” and appears as part of the Holodomor exhibit in the Break the Silence Gallery at the CMHR. Photo credit: Aaron Cohen/CMHR. As the museum is built on Treaty One Territory, great care has been taken to respect the ancestral grounds of the indigenous people who–for more than 6,000 years–have lived near and met at the place where the Red and Assiniboine Rivers meet. Now a National Historic Site, this heart of Winnipeg landmark is called The Forks and is a must for any visitor to Winnipeg. The Indigenous Perspectives Gallery at the CMHR gives great insight into the challenges and lives of our indigenous people. Photo credit: Chronic Creative/CMHR. 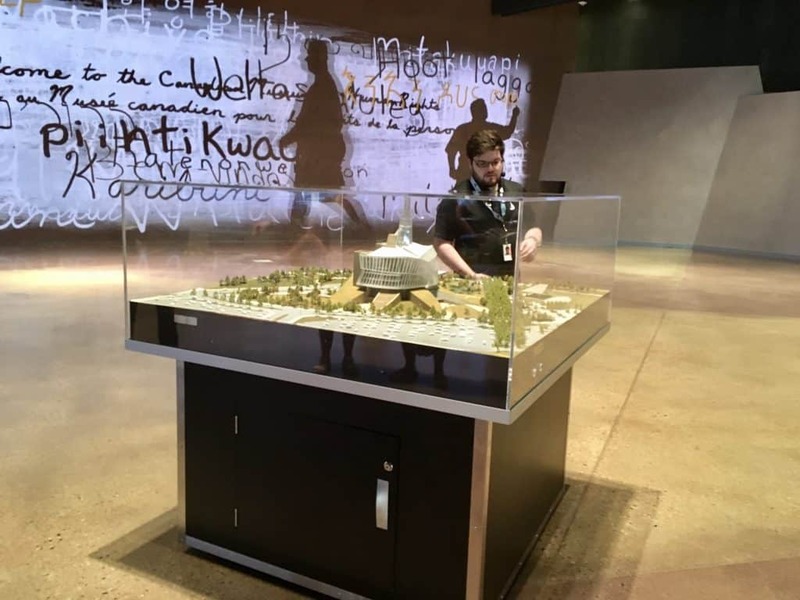 During our 90-minute introductory guided tour we were ensured that consultation with indigenous elders is ongoing, to ensure that every step of construction, development, and expansion of the CMHR was, is, and will be respectful. The building itself is an architectural masterpiece, and for those with a keen interest in architecture, you can take a 90-minute tour devoted to the intricacies of building the CMHR. That’s next on my list! Hats off to American architect Antoine Predock for this inspirational design of hope that combines the vision of a mountain with other aspects of Canada’s natural landscape. It is awe-inspiring, inside and out. 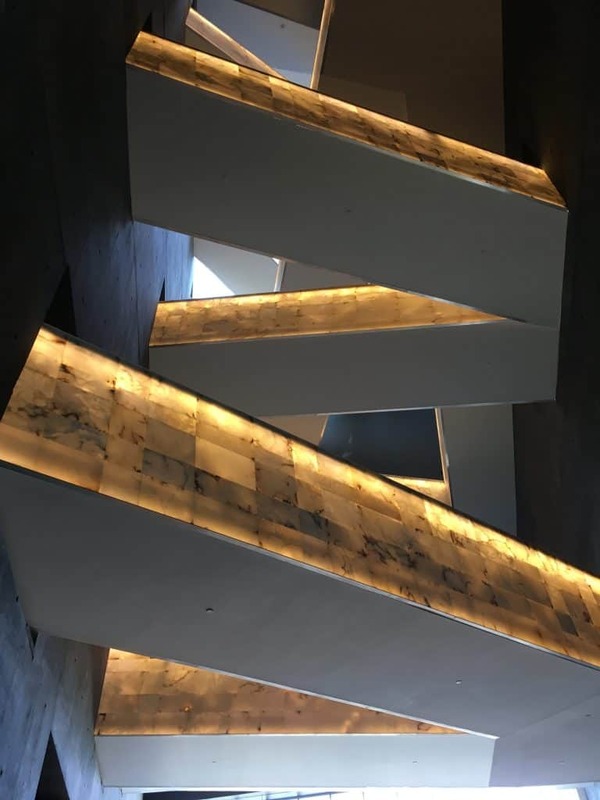 The ramps at the CMHR are made of alabaster and beautifully lit, connecting your journey as you make your way up each level. What also impacted me about the CMHR is how inclusionary it is. There are beautifully lit alabaster ramps that enable visitors to make their way between the seven levels of the museum. 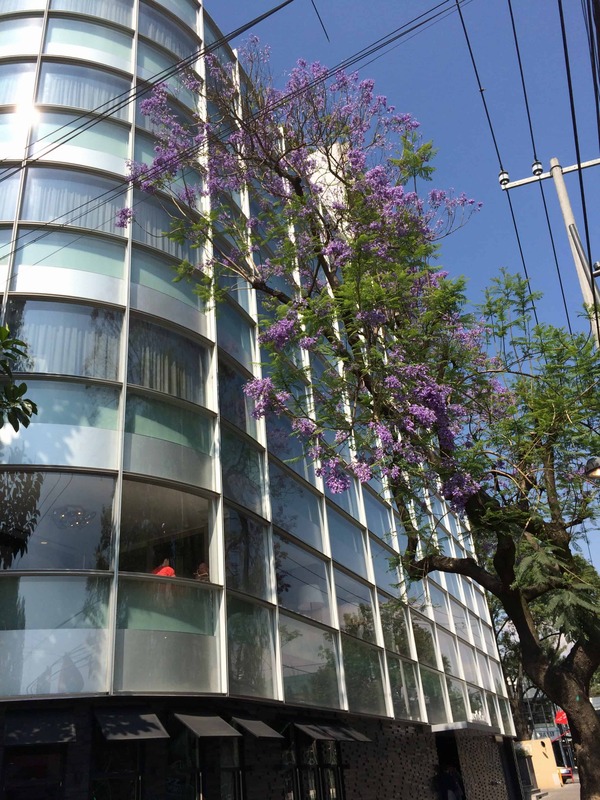 There are also glass elevators that enable you to see the work stations of everyone working in administrative roles at the museum as you rise above them. Close-captioning is used to describe exhibits to the hearing impaired. And there are even three-dimensional replicas of artwork to enable the visually-impaired to see the art in some of the galleries. 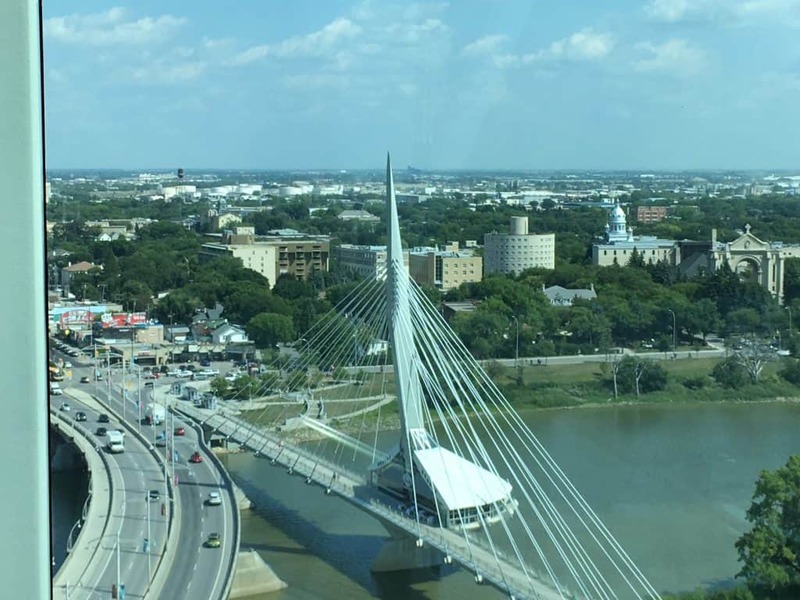 You get marvellous views of the city of Winnipeg from the 8th floor Israel Asper Tower of Hope. Pictured here is Old St. Boniface on the other side of the Red River, the Esplanade Riel walking bridge in the centre, and the St. Boniface Bridge on the left. If you have the time, do plan to spend the day at the CMHR. You’ll find the ERA Bistro at which you can enjoy lunch or a snack indoors or outdoors (weather permitting) as we did. And there is the lovely Boutique gift shop that sells all sorts of gifts, books, and even a nice selection of chocolate. I bought a mini-box of the Peace by Chocolate chocolates made in Antigonish, Nova Scotia, Canada, by a family of Syrian refugees. And I bought a delicious bar by Winnipeg’s Chocolatier Constance Popp, whose shop in St. Boniface is just a short walk or drive over the Esplanade Riel bridge. Constance has lovely chocolate sculptures of the CMHR for sale in her shop. The Boutique gift shop at the Canadian Museum for Human Rights sells chocolates made by a family of Syrian refugees who now live in Nova Scotia, Canada. 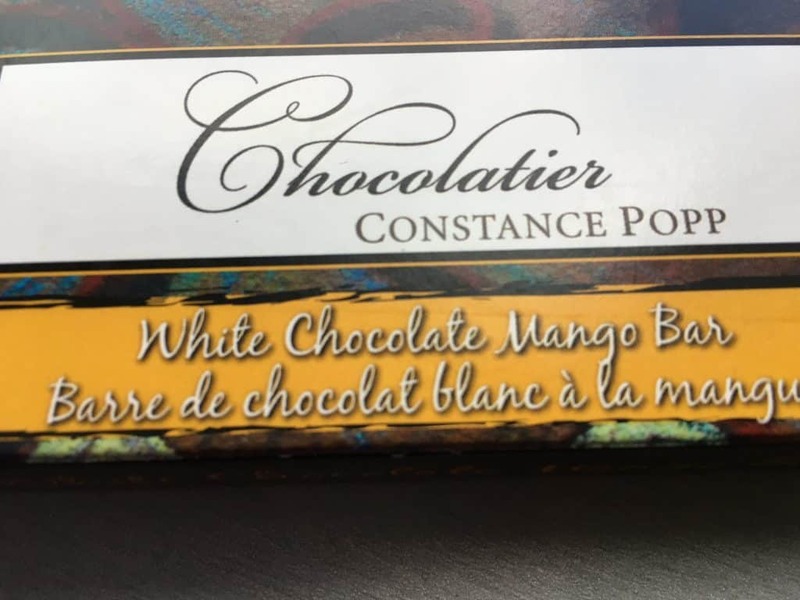 I really loved the White Chocolate Mango Bar from Chocolatier Constance Popp that I purchased in the boutique at the CMHR. 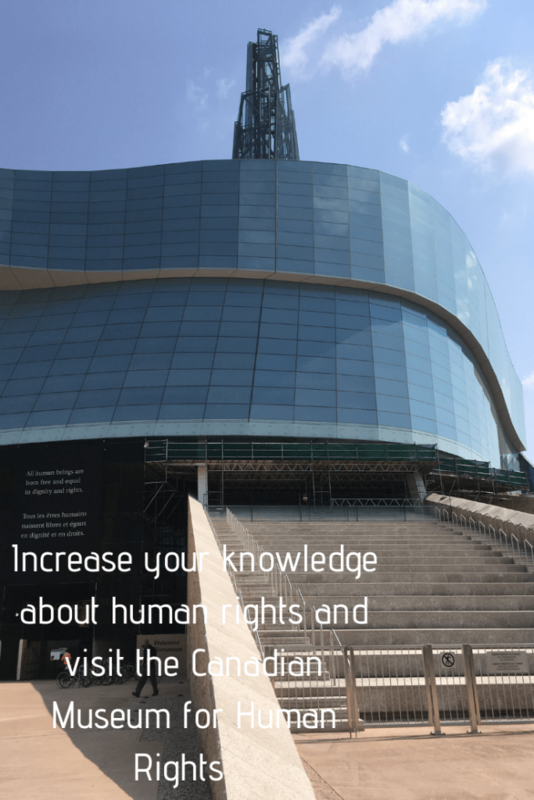 Have you been to the Canadian Museum for Human Rights? What most impacted you about this Winnipeg landmark? Please join the conversation and help me spread the word that the Canadian Museum for Human Rights isn’t all about doom and gloom. It’s filled with lots of natural sunshine and plenty of hope, too. And if you are unable to come to Winnipeg and visit the CMHR but would like to help this amazing facility grow and become sustainable, please consider donating to the museum via this link. Thanks. How awesome – would love to visit this one. It’s something I worry we’re losing in the states. Indeed, Susan. I was really inspired by many of the multi-channel exhibits. Definitely a state-of-the-art facility that everyone should see! Doreen, I’m glad you finally made it to the CMHR. I’ve visited a few times and written about it. It now tops my list of recommendations of what to see in Winnipeg. It is serious and thought-provoking and sometimes somber, but the message overall is definitely not negative but one of hope and inspiration. Right on, Donna. It was your lovely post that helped inspire me to visit the CMHR as you covered it so well. I agree it is truly a Winnipeg gem. I remember reading Donna’s post about this museum and very much hope that I get to visit it some day. I had all of your conflicting emotions about visiting the Holocaust Museum in Washington DC. We went once, but only made it through the first, un-ticketed part. It was wrenching. The last time we went, we only went to the ticketed/time area. It was emotionally overwhelming, but we were both “glad” that we finally did it. And yes, I would do it again. The impact of these places is so intense that to repeat it as to learn more. There is a similar museum in Los Angeles that all of our children went to on school field trips. I think it is so important for everyone to be educated about our history and the ways we can avoid these tragedies in the future. Would that be the Museum of Tolerance, Tami? It can be quite sad and confronting but also very important for us to remember our past mistakes and learn from them and seeing museums like this is a great way to do it. You are SO right, Emily. If we didn’t have places like the CMHR, people might forget about some of the atrocities of the world–or may not even know about them. It’s important that we learn from mistakes of the past, and receive encouragement from triumphs of the world, large and small. A trip to the Human Rights Museum is now on my Bucket List. Thanks Doreen! Why is it that when we travel we look for places to visit but when we are at home we don’t venture where we should in our own amazing backyard! Hoping this fall takes us exploring closer to home. This is the second piece I have read about the museum. Quite a different take especially with the chocolate add-on! 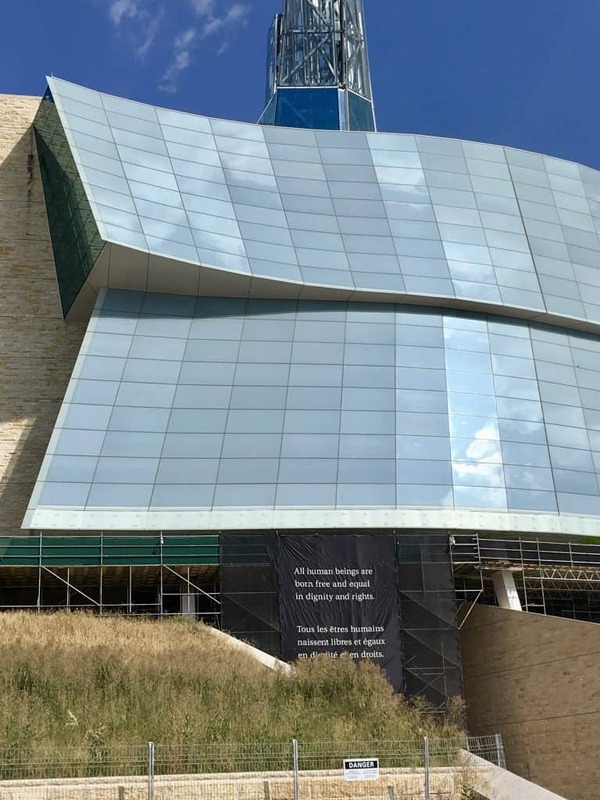 I am Canadian but never been near Winnipeg…so had no idea we had a CMHR. Love their motto even if so hard things are show. I wrote about the Ukranian genocide not long ago too actually, well USSR starvation numbers. Evelyne: I’m not sure where you are, but a trip to Winnipeg is a hidden Canadian treasure. There is plenty to do, especially in the summer, when one festival follows another, which follows another, and another. Journey to Churchill, the $20+ million exhibit at the zoo, which I roundly and loudly criticized as a lousy idea … until I went (I’ve had a membership ever since. 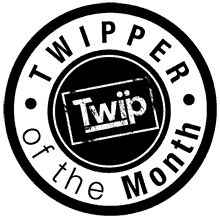 ), is almost worth the visit alone. There are many great walking around areas, surprisingly good food, no matter what your tastes and budget. I came here ten years ago because all my kids were here. The last one left the city five years ago, but here I am, probably for good. Love this place. Hi Evelyne: That is the link to your food article, and yes, I remember that one with affection. I thought you may also had written about the actual events that happened to the Ukrainians. No but I did write about the holocaust in Budapest as I was there last summer. I share your aversion to things that sound depressing – there seem to be enough of those in the news most days, so was glad to get the sense that you found the museum enlightening and a uplifting. I didn’t realize the architecture was so impressive either. 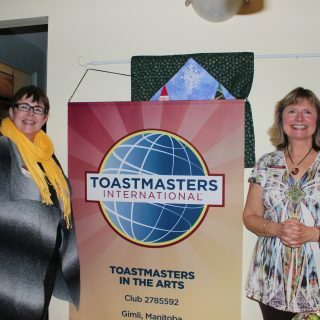 While we probably would have visited on our next trip to Winnipeg, now it is a reason to plan another trip to Winnipeg! Right on, Cindy! May through October is the prime come to come to Winnipeg if you love summer festivals and activities. But for those who love winter, there are also a number of winter activities including the Festival du Voyageurs in February. And any time of year is great to explore the numerous galleries and museums. Well done story, Doreen. I’ve been a few times, and still am awestruck as much by the beauty of the building as the impact of the exhibits. I’m glad they chose to present such serious topics in a beautiful setting. I’m sure you could make an argument that a sombre, austere setting would be appropriate, but I think the beauty allows us to relax and absorb the bright spots, the stories of courage, etc., that we are seeing. Right on, Wendy! I know I definitely would not ever have gone if the museum maintained a sombre feeling throughout. But it was so filled with light and love that it made the sadness tolerable. Thx for sharing your comments. I always look forward to your posts Doreen. What a beautiful view taken from the 8th floor of the Tower of Hope. 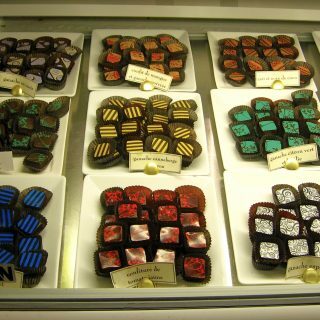 Love the photograph of the chocolates- nice end to what looks like an eventful day. Phoenicia recently posted…What is your motivator for reaching your goal? Thanks very much, Phoenicia. the CMHR is just as much a gallery as it is a museum as there is so much beautiful art within its walls, as well as the incredible views and vistas surrounding the museum. 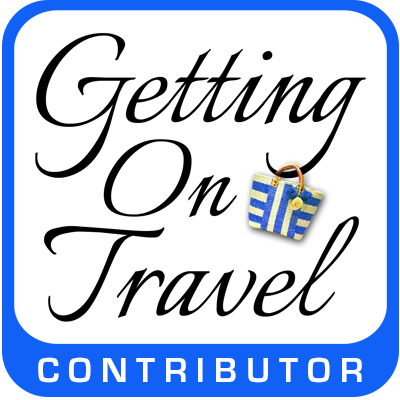 Wonderful article, Doreen ! The famous saying goes something like “those who don’t learn from the past are doomed to repeat it”. The MPI Retirees had a tour I think 2 years ago. Couldn’t possibly have covered the whole CMHR in a couple of hours. The historic aspects, both old and “new”, and the thoughtful, artistic way most things are presented is just mind-boggling. It’s hard to think that so many of our elder citizens who came to Winnipeg were personally affected by the atrocities in various parts of Europe. People the age of our parents. Absolutely, Linda. I don’t think there is anyone who would not be affected by the issues covered at the CMHR. We spent 4 hours during our first visit and I can see spending another 4 hours on a future visit to cover most of the primary exhibits. And then there are always the temporary exhibits that change regularly. Thx for stopping by and sharing your thoughts. I haven’t been, and I can totally understand your hesitation in going. Sounds like a very moving experience. I’ll keep it in mind when I make it that direction. What a beautiful museum and a very well written article. On a topic that could be presented so very differently. This museum would for sure be on my itinerary if I ever plan a visit to Winnipeg. I am a former history & social studies teacher, so historical museums & sites always make my list when I travel. Plus, I think that in this day & age it is so important to be reminded of how far we have come in this world & to not let history repeat itself. You would definitely appreciate the quality of the exhibits at the CMHR, Carrie. I was so impressed by the education level of the people who work there! So much thought has been put into every detail of the museum and everything it sells and stands for. It’s interesting to know that a museum exists for Human Rights as well. It will be a learning for everyone about the atrocities and violence our brothers & sisters had to go through in the past. Hope people take lessons from the museums and learn to respect humanity. Absolutely, Moumita. That is the primary purpose of the museum. Learn from our mistakes and do better in the future. Thx for stopping by. Great write-up Doreen. It’s especially timely as the museum also recognizes the genocide of the Mayan people of Guatemala by the military and government forces. A persecution that continued for decades. I haven’t seen that exhibit re the Mayans, Michele. We only spent 4 hours at the museum including tour, a light lunch, shopping and taking some pics. Must definitely go back! What a great idea for a museum! I like that it celebrates the ancestral lands it stands on. Hi Karen: Yes, I thought that was pretty cool, too. The recent Manitoba governments have been quite conscious of the importance of having respect for the land that the indigenous people hold sacred. What a fascinating museum. Never heard of it, thanks for writing about it and one that I would love to check out. How interesting is the Treaty One Territory. What a respectful cultural and historical experience. Looking forward to visiting this museum. 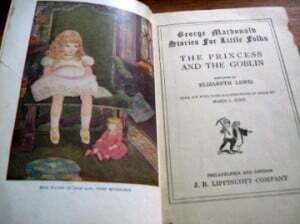 Hi Rosemary, and thanks very much for stopping by my blog. I think it is your first visit? Yes, Winnipeg should be (and is) proud to be home to such a magnificent and meaningful facility. The perfect blend of contemporary and historical culture. Our last visit to Winnipeg was August 2014 so all we got to see was the building. Global did a story on it so we did get to see some of the displays. It will definitely be on our to do list on our next visit. Hoping you can be our personal tour guide! This seems like a heavy museum, but an important one. Unfortunately, it seems to be an issue that needs revisiting these days. That is for certain, Mags. It is so unfortunate (and scary!) that we are still discussing issues of racial violence, prejudice, segregation, and genocide in today’s world. Nick was my tour guide, too!! Nick is an amazing guide. And I love how he has his own personal stories, having grown up in a very remote community up north where people would starve if not for outside intervention. So very true, Kartik. I hope there are people in your area who are spreading the love. We have a movement happening here where I live called “Silence is Violence” in support of the hateful activities that have recently happened in the US. Looks like a very moving place to visit. The statue of the sad little girl is heartbreaking, yet so thought-provoking. I agree, Melody. It really spoke to me. The CMHR sounds like a really effective museum, and the architecture is wonderful! It’s an art to present a topic that can be grim in a way that isn’t just depressing. I’ve seen others that are effective in dealing with grim topics, especially Yad Vashem, the Holocaust museum in Israel and the museum in Hiroshima too. Thanks for alerting us to those museums, Rachel. It is good to know that there are other facilities that also have done a good job of telling sad stories by infusing light and hope. What a wonderful place. As you know, I live near the Canadian border, and grew up on Canadian TV and culture. I have noticed, that in Canada, the wrongs of the past are exposed and expressed more openly than here in the US. I am glad to see a museum based on Human Rights, we must stop looking at others, as others. And start accepting them as rightful tenants of this planet. Thank for that profound statement, William. I believe that if more people visit facilities like the Canadian Museum for Human Rights, they would increase they understanding of and tolerance for others tenfold. I’ve been to events at the museum but have not yet been through the exhibits; my out-of-town guests have been and have been admiring of the content. I must get myself there! In the meantime, I love the spire in the city’s skyline, and I love having this museum in Winnipeg. I’m sure it’s not perfect, but then I believe that perfection is the enemy of achievement: We have the museum and I know it’s contributing to dialogue, thought and community building. So true, Amanda. A facility of this type will never please everyone 100%. But I am so impressed with the integrity and passion that have been put into the design and the exhibits. It truly is a world class museum gallery of which we should all be proud. Thx for stopping by and sharing your thoughts. About time you got there! 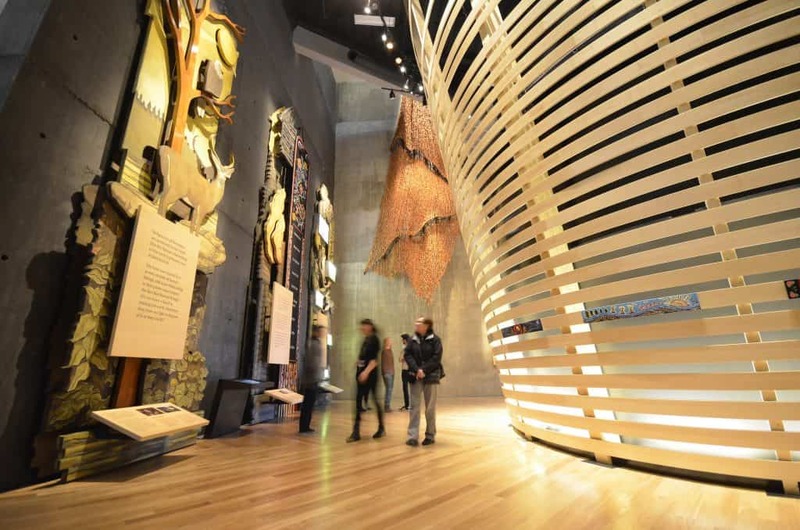 How can this museum be a sobering and uplifting experience at the same time?! So well done! We encourage our guests at Evergreen Gate B and B to go , and even those who are not normally ” museum types” engage with the displays and messages and find they have not allowed enough time…..One of the best surprises for me in the museum was finding a couple of Winnipeg friends profiled on the main floor, for their accomplishments in the LGBQT (did I get all the letters?) area. I think I would have been like you – not wanting to visit a place which I thought might be depressing. How lovely that it is not like that at all. For much the same reason David and I have decided not to visit The Killing Fields when we are in Cambodia next year, notwithstanding that we could sign up for a tour from our river cruise boat. David, in particularly, feels very strongly that suffering and misery should not become a tourist attraction. I agree with him but I don’t think I could stick to my principles as solidly as he does. Thanks very much for sharing your thoughts, Lyn. I agree that I don’t like the idea of making a tourist attraction out of someone’s pain and suffering. But when it’s done with the intent to educate and inspire as the CMHR has done, it is a wonderful learning tool for us all. Not sure if I’ll ever make it to Winnipeg Doreen but if I ever do this museum will definitely be on my must see list. Sherryl Perry recently posted…Do You Want to Consolidate Multiple Websites? 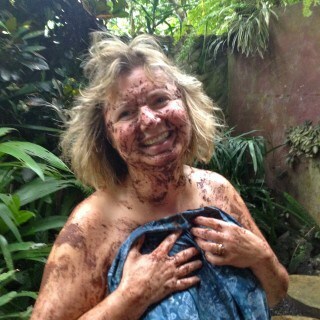 I love that Donna’s post inspired you to visit. Like you I had reservations about visiting he Human Rights Museum in Atlanta. Especially with all the negative news surrounding us. It was an intense and thought provoking experience, one that brought me to tears. If we are to learn from our history, it’s so important to try and understand our past. If i’m ever in Winnipeg, I’ll make sure to get there. Thanks so much for sharing your thoughts and experience, Alison. This museum is indeed unique and also the message it is spreading is so much needed as well as commendable.The world would be a better place if the countries and politicians of the world believed in the motto of this museum. 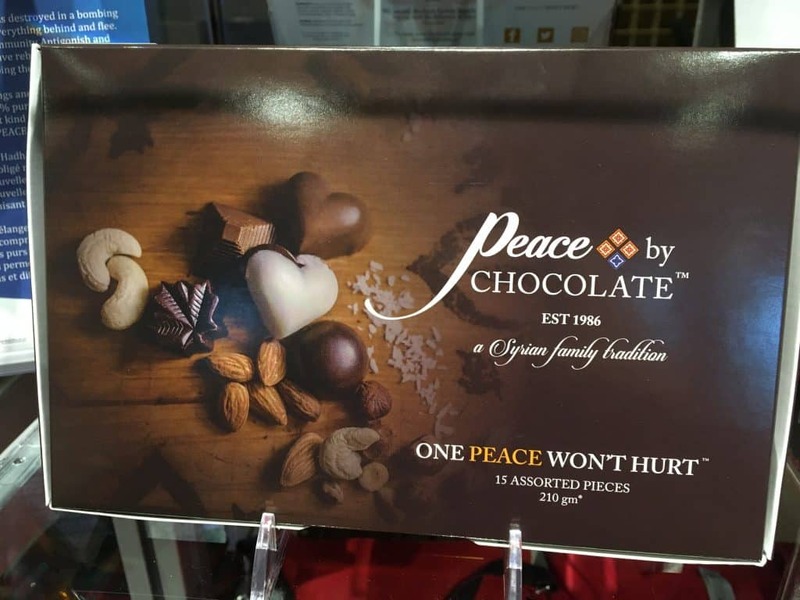 I was touched by the peace by chocolate message too. Thanks for your comment, Sandy. I think we need to invite some key politicians of the world to the CMHR. We would love to walk Mr. Trump through each and every one of the exhibits to be sure he doesn’t miss anything! Hi Neha. Canada is a very big country, and Winnipeg is located right in the middle of the country. 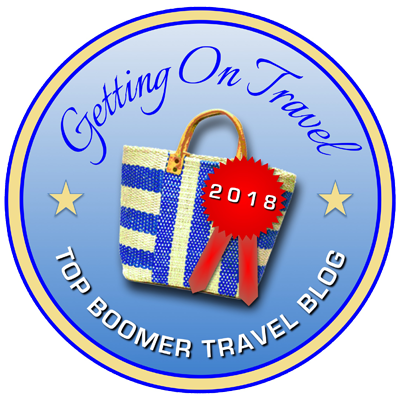 Be sure to do your research to determine which sites and activities are most important you, and then plan your visit around it as you can’t possibly see the entire country in one visit. Never been but it is on my list. And in this day and current political climate even more important to see. This is the kind of museum that should be on everyone’s list. So thought provoking and important to look back at the mistakes we have made and what they have led to. 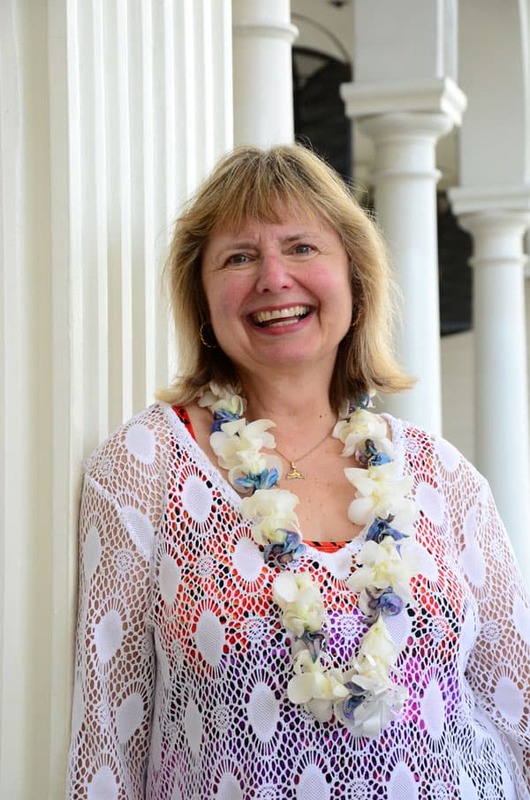 Rossana Wyatt – Life is Full of Adventures recently posted…Learn more about AlarmForce, protecting home while travelling. You bet, Rossana. I think the Canadian Museum for Human Rights in Winnipeg should be on everyone’s bucket list. Thx for stopping by. Winnipeg is one of my favourite cities! Although I have to say I haven’t been to this museum…yet! Holocaust has been one of the darkest chapter of the human history. The gas canisters on display must give some goosebumps. It’s heart breaking to know the bit about your Ukrainian connection and how your extended family could have been a victim. Poignant places like these make me silent in contemplation. Abhinav Singh recently posted…India Book Of Records: The Epic Road Trip to Highest Blogger Meet near Khardung La in Ladakh, Incredible India! Thanks Doreen, you’ve inspired me to make a visit to the museum. Fabulous, Mike! As someone I know to be concerned with human rights, I know you will enjoy it. And there is an exhibit on one of the upper levels focusing on labour rights as well, I can’t remember if it was UNIFOR or another national union that was featured. Congrats to the Canadian Museum for Human Rights for being featured on the new (2018 issued) Canadian $10 bill. On the other side of the bill is an image of Viola Desmond, who is featured at the CMHR in an exhibit championing her fight for human rights in Nova Scotia. 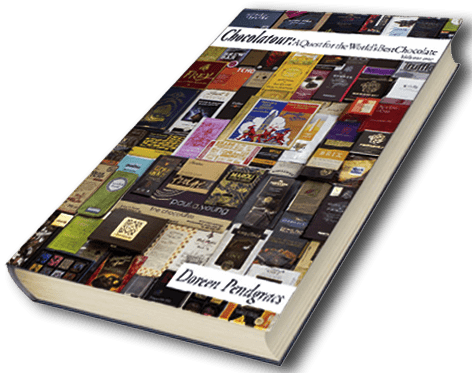 Thank you for sending this post to me, Doreen, as I just today learned of Peace By Chocolate, and don’t remember reading this post, in which you include this company owned and operated by a family of Syrian refugees who are “picking up where they left off” from their chocolate company in Syria. I remember being in Winnipeg and hearing about the CMHR. 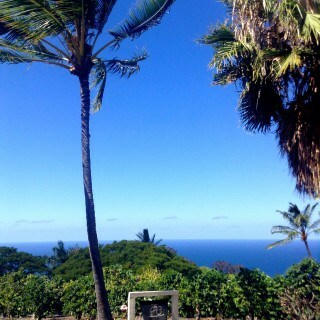 It’s lovely to visit it virtually with you and I hope to go with you for an actual visit. That would be amazing, Christine. I would love to tour the Canadian Museum for Human Rights with you. It is such an incredible venue. Right now, they have the Nelson Mandela exhibit on, in honour of what would have been his 100th birthday.